Home » Pillows » 6 Best Bamboo Pillows of 2019: Should You Invest in a Cool, Contouring Pillow Made with Natural Fibers? Are you looking for targeted neck and shoulder support? How about a comfortable pillow that can help restore your body after a long day without retaining heat? If so, you may want to consider a bamboo pillow. Our top pick is the Snuggle-Pedic Ultra-Luxury Bamboo Pillow because it’s guaranteed not to go flat. 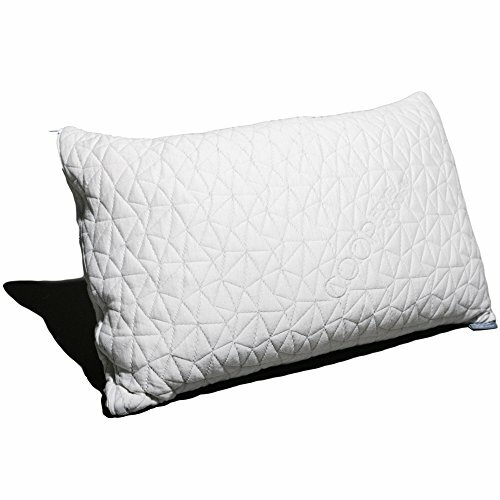 Our runner-up choice is the Coop Home Goods Adjustable Loft Pillow because it works for all sleep positions. Both options provide a cool sleeping experience and contouring pressure relief. Bamboo pillows are usually made with memory foam and can be an alternative to splurging on an entirely new memory foam mattress. By using a bamboo pillow to support at least part of your body with memory foam, you can potentially ease daily pain and tension. But why is it called a bamboo pillow? Is it the right option for you and worth the cost? This article will cover 5 of the best bamboo pillows available on the market, along with information about their construction, frequently asked questions, and more. To make your pillow hunt a little easier, we compiled a list of the six best bamboo pillows available on the market today. Each has been highly rated by users and is made with quality materials. The Snuggle-Pedic Ultra-Luxury Bamboo Pillow is made with shredded memory foam, which uses smaller pieces of foam (instead of one solid piece) for a more moldable pillow. It has a breathable cover to keep you cool and is made with CertiPUR-US® certified foam, which means the material was tested for harmful levels of toxic chemicals. The Snuggle-Pedic Bamboo Pillow has a removable outer cover that makes washing easy. You can also adjust the fill level to make the pillow softer or firmer for customized comfort. The conforming shape of this pillow will support your neck and shoulders in the back, stomach, or side sleeping positions. It’s made with hypoallergenic and dust mite-resistant materials for those sensitive to allergens. The Snuggle-Pedic Bamboo Pillow is backed by a 120-night sleep trial period and a 20-year warranty. The Coop Home Goods Adjustable Pillow with a bamboo-derived case is an adjustable pillow made with shredded memory foam. The proprietary blend of visco-elastic foam material can be added or removed to create a custom level of firmness. This pillow is made without harmful amounts of formaldehyde, heavy metals, or other toxins. The Coop Home Goods Adjustable Loft Pillow is resistant to dust mites and easy to care for – just throw it in the washing machine when it needs cleaning. When you first unpack the pillow and let it expand, you may need to wait a day or two for the off-gassing odor to dissipate. Note that if you wash this in the washing machine, it may take a few cycles before it dries completely. This product is backed by a five-year warranty that guarantees it won’t go flat within that time. If you aren’t satisfied with your Coop Home Goods Adjustable Loft Pillow you can return it for a full refund as long as you do so within 100 days. The Original Bamboo Cooling Pillow uses shredded foam to create a soft, conforming sleep surface. It can be adjusted to the shape and size that you like best by adding or removing fill and works for all sleeping positions. The bamboo case on this pillow is soft, comfortable, and breathable. Note that you may notice an off-gassing odor when you first unwrap this product, but it should go away within a week, at most. This pillow comes with the benefit of a decent price tag, compared to some of the other bamboo pillows on our list. For warranty information on the Original Bamboo Cooling Pillow, contact the seller directly. The Wondersleep Adjustable Loft Pillow comes in a two-pack with shredded memory foam that you can adjust for a customized firmness level. In order to make the pillow fluffier, you can either add extra filling or fluff the pillow to redistribute the foam. When these pillows are first delivered, they’ll take about 30 minutes to expand to their full size. 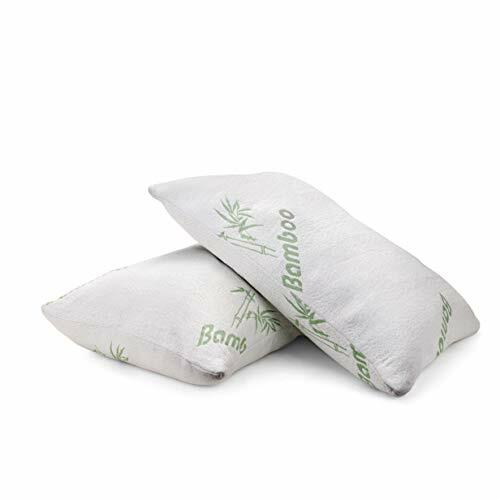 This product uses 40 percent high-quality bamboo-derived fabric and 60 percent polyester, to help your pillow stay cool as you sleep. Both the cover and pillow itself can be washed in the washing machine. If you’re very sensitive to off-gassing odors, you can unwrap the pillow, take off the outer pillowcase and let the pillow rest in a room with open windows. The Wondersleep Adjustable Loft Pillow is at an affordable price and comes with a one-year warranty that protects against manufacturing defects. The Luxury Premium Shredded Memory Foam Pillow has been designed and altered based on customer feedback. It has a hypoallergenic cover stitched to provide extra support. Users reported that the old inner cover was too stiff so the company redesigned it to be more flexible. The shredded memory foam was tested in various sizes and shapes before they decided on the final design. The foam mixture is handcrafted and provides support and breathability for sleepers. You can adjust the fill amount to fit your preferences, no matter which sleep position you prefer. 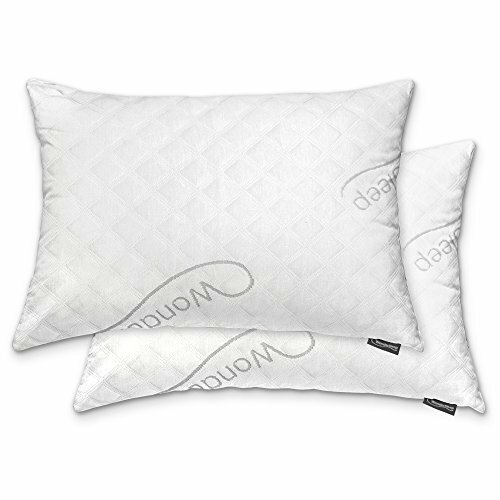 The Original Bamboo Luxury Memory Foam Pillow can be machine washed and the foam will return to its original shape like new. This product comes with a five-year guarantee that states it won’t go flat within that period of time. 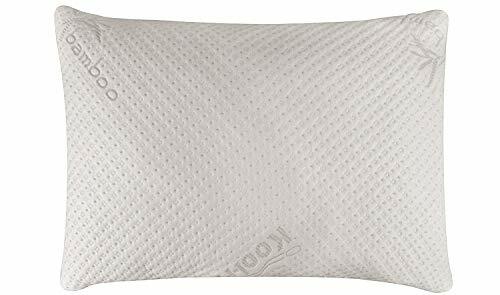 The Plixio Shredded Memory Foam Bamboo Pillow is made with a hypoallergenic, moisture-wicking cover. It’s firm enough to support your neck and help keep your airways clear, which is why it may be an effective remedy for snoring. This support can also help with tension and pain in the shoulders. These memory foam pillows can be adjusted to be softer or firmer. For a softer sleeping surface, you can put your Plixio Bamboo pillow in the dryer for a few minutes, which will fluff up the foam. The pillow comes with a removable cover and is covered by a two-year warranty. When you first heard about bamboo pillows, you might have been confused. Bamboo isn’t exactly associated with softness or comfort. But the “bamboo” in bamboo pillows usually refers to the fibers used in the pillow cover and not the filling. Bamboo-derived material is breathable and natural, making it a popular choice for memory foam pillows. What makes bamboo pillows so special in a sea of competitor’s products? Let’s look closely at some of the benefits associated with this type of product. Eco-friendliness: Bamboo is a natural product, grown across the world in multiple countries. It grows fast and only takes a few weeks to grow into a full crop again after being harvested. It also comes with the benefit of not needing pesticides or chemical treatment, like other plant-based materials require. Although processing bamboo to make it into fibers does still require chemicals, it uses far less than other fabrics, such as nylon. Hypoallergenic: Bamboo is a naturally hypoallergenic material. Polyester, nylon, and cotton can all cause topical allergic reactions in some sleepers. However, bamboo pillows usually don’t have this issue, according to user reviews. Pressure relief: Again, bamboo pillows tend to use memory foam in their design. Since memory foam is known for providing contouring pressure relief, if you pick up a bamboo pillow, you could be on your way to solving neck and shoulder tension. Cooling properties: Memory foam is known for retaining heat more than other materials, so it’s important to use a breathable, cooling fabric with it. 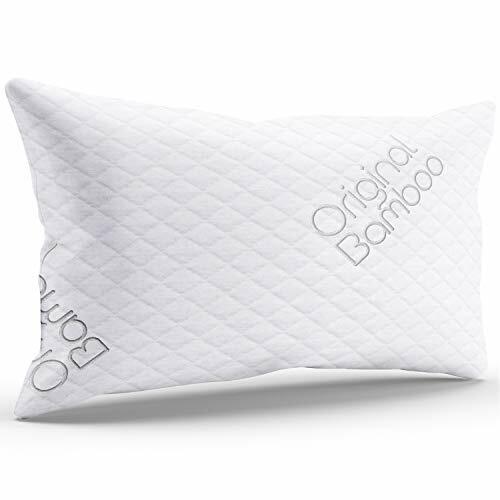 Bamboo pillow covers wick away heat and moisture, helping you stay at a comfortable temperature as you sleep. Since hot sleeping is a common issue for many people, a cooling product like this can make a big difference. The sleep position you usually prefer will have an impact on the type of pillow you should use for optimal comfort and alignment. The ideal pillow will hold your head so that your spine stays straight throughout the night. Stomach sleepers: Stomach sleepers will typically do best with a soft and low-profile pillow. If you use a fluffy or overly firm pillow while resting on your stomach, your head will be too high, throwing your spine out of alignment. A soft or low-profile pillow, on the other hand, will allow you to rest in a healthy and comfortable sleeping posture. Side sleepers: Side sleepers should make sure their pillow fills the space between their head and shoulder enough for a comfortable neck position. A pillow that’s too low or too high will cause the head to rest at an unnatural angle and likely lead to pain in the shoulders or neck. Typically, a firm and medium-profile pillow will fit the bill for the average side sleeper. Back sleepers: Back sleepers will do well with medium-profile and medium-firmness pillows, in most cases. This will allow their head to rest at a comfortable angle without sinking in too far or being too propped up, both of which can lead to neck or shoulder discomfort. Other factors that will impact your ideal pillow shape and firmness are the type of mattress you use and your body type. People with wider shoulders may require larger pillows to properly support their head and neck. A softer mattress should be used with a softer pillow and firmer mattresses with firmer pillows. 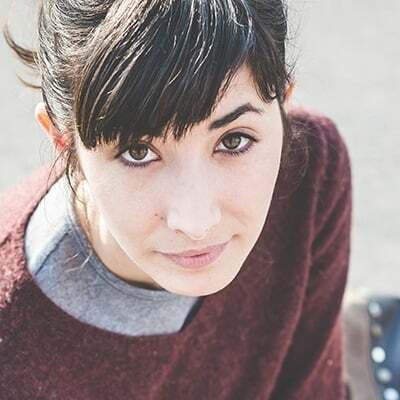 But, while your sleep position will have an impact on the type of pillow you’re likeliest to prefer, it also all comes down to personal taste. You may have noticed we used the term “shredded memory foam” a lot in this article. What’s the difference between solid or shredded foam? Solid memory foam is made from one single piece of foam and often has a curved shape for firm support. Shredded foam, on the other hand, is made from many small pieces of memory foam, making the pillow more moldable. Shredded foam pillows often come with the benefit of being able to add or remove filling to customize your pillow. Let It Air Out: Before your pillow is ready to use, it may require some time to air out. Memory foam often comes with an off-gassing odor (compared to a chemical or “new car smell”) which can be irritating to some sleepers. Let your pillow air out in a well-ventilated room. If the smell doesn’t dissipate, you can try washing the pillow before you use it. How to Fluff Your Pillow: Your pillow will likely be very full when it’s first delivered, but after using it for a while, it may lose some of its original shape. Over time, your neck and head will press against the material, making it more compact than it was at first. With shredded memory foam, fluffing your pillow is an easy process. Just throw it in the dryer for 10 to 15 minutes. As you use your pillow night after night, it will absorb your sweat and natural oils, potentially attracting pests and breaking down the materials. You can remove the pillow cover and wash it as often as you like, but you should also wash the actual pillow once every couple months or as needed. Some bamboo pillows are washing machine safe or you can wash yours by hand. Hand washing is gentler, so if you want to make your bamboo pillow last as long as possible, you may want to go with that. To wash your pillow by hand, fill up the sink or a bucket with warm water, add some mild laundry soap, and submerge the pillow. Massage the pillow for a few minutes to work the soap through and then repeat the process, using just cold water with no soap. You can dry your pillow in the dryer or hang it to dry (but this will take longer, of course). Bamboo pillows are more expensive than ordinary pillows, but there are plenty of affordable options. You can find quality options for less than $20 and luxury pillows that cost a few hundred. For the average bamboo pillow, though, you’ll probably be looking at $50. Although they do cost more than the average pillow, they also tend to last longer. Most bamboo pillow manufacturers will include a warranty with your purchase. Always read the fine print to make sure you agree with the conditions and length of the warranty before making your investment. If you’re buying through a third-party, like Amazon, and the warranty information isn’t listed, contact the seller directly. As with any other purchase, there are unique concerns that come along with buying a bamboo pillow. Here are some frequently asked questions. Q: How are bamboo pillows made? A: Most bamboo pillows aren’t actually made out of bamboo and typically don’t have much bamboo in them. Instead, the material is usually incorporated in the cover. Bamboo is harvested and then processed to create small fibers, and treated with chemicals to soften them. This fiber is then turned into yarn and used to make bamboo-based clothing, sheets, and covers. The result is a breathable, soft fabric. Q: What causes the off-gassing odor associated with many bamboo pillows? A: One commonly reported downside to bamboo pillows is their off-gassing odor, which some are more sensitive to than others. Although the smell will usually dissipate within hours or days, sometimes it sticks around longer. This smell may be caused by formaldehyde, methylene, or other chemicals used in the process of manufacturing memory foam. Most mattress companies now test their foams to ensure that there are no harmful levels of these chemicals present. But if the smell doesn’t dissipate after an airing-out period, try washing your pillow and using an extra pillow cover. Q: Should I use an additional pillow cover with my bamboo pillow? A: Most bamboo pillows come with removable covers already, but should you sleep directly on them? While you may do this and it would be perfectly fine, using an additional cover can preserve your pillow for longer. While you sleep, your skin cells, natural oils, and germs will soak into your pillow night after night. You can help keep it cleaner by adding a case on top of the included cover. Q: Is it possible to have a bamboo allergy? A: You may have noticed that most of the bamboo pillows on our list were labeled as “hypoallergenic.” Bamboo allergies are extremely rare. If you do notice irritation after sleeping on your pillow, it’s probably from another material present in the pillow and not the bamboo. 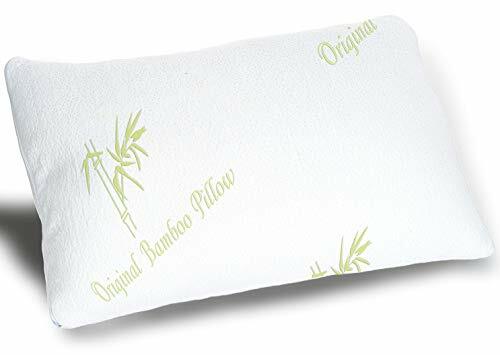 Overall, a bamboo pillow could be a good option for someone who struggles with sleeping too hot and needs some contouring support for their neck. Shredded memory foam will typically be more agreeable than ordinary memory foam since it makes a more moldable pillow. Most bamboo pillow options come with an adjustable feature that allows you to add or remove filling to customize the firmness level of the pillow.